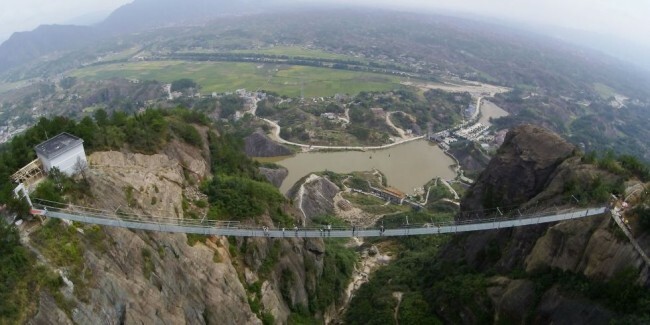 It’s a bridge to nowhere from nowhere, but with a transparent floor made from real glass and a 590 foot drop to the ground, the “Haohan Qiao” or “Brave Man’s Bridge” in Shiniuzhai National Geological Park​ is the country’s scariest but perfectly safe suspension bridge. This tourist attraction is not for the faint of the heart. 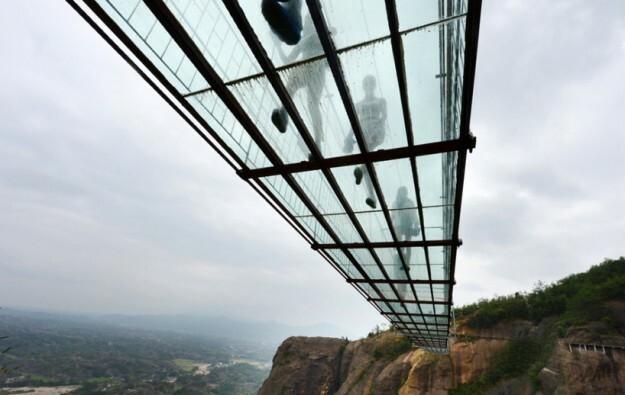 China has opened a glass bottomed bridge hovering 590 feet above the valley floor in Pingjiang county in Hunan province. Stretching almost 1,000 feet long, the glass suspension bridge is named Haohan Qiao, translating in English to “Brave Men’s Bridge” and it’s not hard to see why. The bridge was originally wooden until its conversion using glass panes 24mm thick (about .95 inches) and 25 times stronger than normal glass. Outside of setting records, the glass architecture is meant to minimise any disruption to the surrounding scenery. With a suspension constructed only of two side steel beams, banisters with side-hanging stay cables and a glass deck, the bridge may look minimal – but it can withstand high winds, earthquakes, frost and the weight of 800 visitors at a time. Of course, if walking across it isn’t enough of an adventure, the bridge also has plans to offer the highest bungee jump in the world, beating out current record holder, the 233m Macau Tower bungee jump.